San Diego is known as America’s Finest City for several reasons, and the development of its downtown districts over the last few years is one of the most prominent markets for real estate. Downtown San Diego is a fine place to live, and you shouldn’t need too many reasons to make it your new home. Nonetheless, here are five signs that tell you a move to this Southern California city is in your future. In early September, tech giant Amazon announced its intention to expand its presence in San Diego with the acquisition of office space in the University Town Center neighborhood, an easy commute from the downtown area. This Amazon expansion includes 300 job openings in the fields of machine learning, digital entertainment, artificial intelligence, and e-commerce development. Days before this announcement, a Forbes magazine report indicated that Horton Plaza in the trendy Gaslamp district is being redeveloped for the purpose of attracting technology companies. Of all Southern California’s metropolitan areas, downtown San Diego has become one of the most appealing for people who don’t feel like driving everywhere. 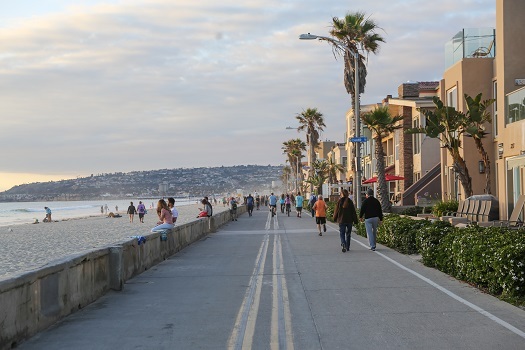 The most walkable neighborhoods in San Diego are located in the downtown area: Little Italy, Gaslamp, Core-Columbia, East Village, and the Marina districts are perfect for residents who enjoy walking to their favorite shopping and entertainment venues. The San Diego dating scene has vastly improved in recent years. Whereas in the past there was a bit of a gender imbalance because of the various military bases in the region, this is certainly not the case in today’s downtown districts. Quite a few single professionals are choosing to make San Diego their new home, and they come from all walks of life. If you’re looking for diversity and a vibrant sense of community, downtown San Diego is right for you. Located just north of the downtown districts, Balboa Park is a cultural mecca where you can find more than a dozen museums and performance spaces. West of Balboa Park is a neighborhood that combines history with gastronomy: Little Italy. San Diego condos are readily available in the Gaslamp and East Village districts, which are known for their lively nightlife scenes, and the Marina neighborhood is home to nautical museums as well as the San Diego Convention Center, where you can always find interesting events happening. As a major housing market in California, downtown San Diego has enjoyed more growth and stability than Los Angeles and San Francisco because flippers and speculators haven’t been as active. San Diego is where luxury condominium developers are setting their sights, and this is the type of housing serious real estate investors view as long-term opportunities. If you’ve been thinking about relocating and purchasing a downtown San Diego condo, now is the time. A knowledgeable agent from 92101 Urban Living can help you find the perfect property to suit your lifestyle. Call 619-649-0368 today to schedule an appointment.